Gig BAR 2 adds to the original ultimate pack and go 4-in-1 light by including UV in its pars and strobes for increased color mixing and effects. Gig BAR 2 includes a pair of LED Derby fixtures, LED pars, a laser, and 4 high-power, LED strobe lights all mounted on one bar. 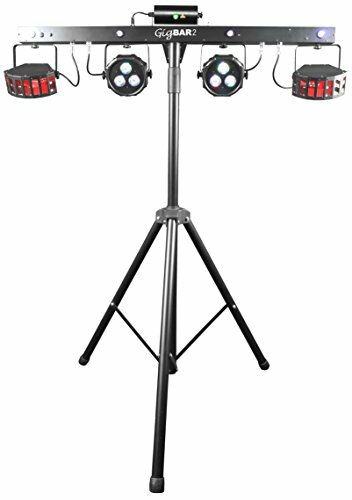 4 individually adjustable and interchangeable heads let you cover any room or stage. Gig BAR 2 strobes allow you to create exciting chase and slow-motion effects and the adjustable red and green laser scatters hundreds of bright dots and beams in all the right directions. Phenomenal built in automated and sound-activated programs are on board that include all 4 effects to make one complete show and you can easily control the unit from the display, IRC, wireless foot switch or DMX to take your gig to a higher level. Master/slave multiple units under the control of a single IRC or wireless foot switch and save time running cables and extension cords by power linking multiple units. Gig BAR 2 is ready for every application using the included mounting brackets to attach to truss. Get in and get out quickly with the included tripod, wireless footswitch and FREE carry bags.